Making specific patterns on clay has never been easier. 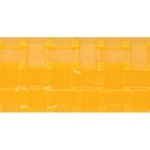 Pattern rollers are made of a lightweight plastic and non-stick material the pattern is easily transferred evenly onto the clay with minimal effort. Length 3-3/4. Roller length 1-3/4.